Be the first to share your favorite memory, photo or story of Morris. This memorial page is dedicated for family, friends and future generations to celebrate the life of their loved one. 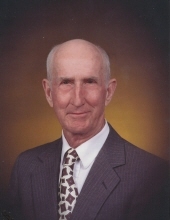 Morris Hampton Thomas, 95, of Amherst passed away on Wednesday, April 10, 2019 at Fairmont Crossing. He was born on July 9, 1923 in Clifford, VA to the late William Frank Thomas and Alma Harvey Thomas. In addition to his parents, he was predeceased by his brothers and sisters-in-law: W. Aubrey (Laura) Thomas, Lowell E. (Beth) Thomas, Sr. and Harvey A. (Alice) Thomas. He is survived by his wife of 68 years, Jean Campbell Thomas; daughter, Sandra Gayle Thomas of Charlottesville; son, Robert Hampton Thomas and his wife, Noel Snow Thomas of Lynchburg; grandson, Mark Hampton Thomas of Arlington; and, granddaughter, Sarah Elizabeth Thomas of Denver, as well as his sister-in-law and brother-in-law, Peggy C. and Harold R. Camden of Jamestown, TN. Additionally, he is survived by a host of nieces and nephews and their children. He was a life-long member of Clifford Baptist Church where he served as a deacon and trustee and was honored as a deacon emeritus. He served on the board of directors of the Amherst Farm Bureau and Amherst Cemetary and was active in the Cattlemen’s Association. Morris graduated from Amherst High School in 1942 and served in the US Army during World War II. He worked at American Cyanamid in Piney River, VA and Babcock & Wilcox before retiring from Central Virginia Training School as an electrician in 1985. All this time he was raising beef cattle on the family farm in Turkey Mountain. He loved traveling, visiting 13 countries and 49 states, missing only North Dakota. His last big trip was a cruise to the Panama Canal at 87. In addition to beef cattle farming he enjoyed all types of games, including a competitive game of Rook whether with his contemporaries or grandchildren, trail riding and working in his vegetable garden. On his 80th birthday he rode his horse to Clifford Baptist Church as he had done as a youth. Visitation will be held on Friday, April 12 at Clifford Baptist Church from 6pm to 8pm. Funeral services will be at the church on Saturday, April 13 at 2 PM. Services will be conducted by the Rev. Dr. Michael Fitzgerald, Rev. Clyde Mawyer and Rev. Jeffrey Campbell. In lieu of flowers, the family requests contributions to Clifford Baptist Church, 635 Fletchers Level Road, Amherst, VA 24521; Piney River Volunteer Fire Department, PO Box 28, Piney River, VA 22964; or the Amherst Life Saving Crew, PO Box 193, Amherst, VA 24521. To send flowers or a remembrance gift to the family of Morris Hampton Thomas, please visit our Tribute Store. "Email Address" would like to share the life celebration of Morris Hampton Thomas. Click on the "link" to go to share a favorite memory or leave a condolence message for the family.